Metals: from 1936 to 1939 Copper (Cu), from 1939 to 1943 Bronze. 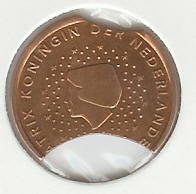 This coin was minted in the years you see on the left. Difficult to found are: 1936. From 1936 to 1939 (included) the coins where minted in Copper (Cu) the colour is a bit red because of a small quantity of tin and zinc, from 1939(included) the coin are of Bronze (Copper, aluminium, zinc) and the colour tend to be a bit yellow. The copper coin, when circulated that a very nice black coloration.